The exact cause of DSLD has not been identified. Genetic and environmental factors are likely involved. A few years ago, it was thought that horses with DSLD were laying down abnormal proteoglycans (a type of protein) in the suspensory ligaments, as well as other tissues in the body. The condition was termed equine systemic proteoglycan accumulation (ESPA). That theory was recently disputed and is no longer widely accepted. Other research has proposed that horses with DSLD have an abnormal healing process in the suspensory ligaments. Wear and tear associated with normal regular exercise causes small "microtraumas" that occur in the suspensory ligaments. Normal horses produce more cells that lay down additional collagen fibers to repair the ligament. In horses with DSLD, these cells do not lay down collagen, but convert to a type of cell that produces cartilage instead. This abnormal tissue within the ligaments does not allow it to stretch and extend normally, so breakdown occurs. The condition is more prevalent in certain bloodlines, indicating that there may be a genetic predisposition. However, a genetic marker has not yet been identified, so there is not currently a genetic test that can be done to indicate a horse's possibility of developing the disease. It is recommended that any horse affected not be bred, in case the trait can be passed to offspring. In more advanced cases, the diagnosis of DSLD may be as simple as observing the horse and watching it move. In other cases, mild lameness may be the only sign and diagnostic tests will need to be done. 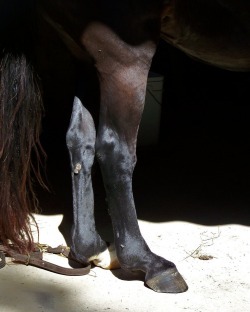 Lameness upon flexion of the lower limb can indicate pain in the suspensory ligaments. Upon palpation, the suspensories may be hard and taut from fibrosis, lumpy areas may be present from calcification, or they may even be soft and mushy from inflammation and edema. Ultrasonographic evaluation usually reveals enlargement in the circumference of the suspensory branches, tearing of collagen fibers, irregular fiber pattern, and sometimes calcification within the ligament itself. Unfortunately there is no cure for this condition. It is a disease that must be managed with lifestyle changes and environmental management. Therapeutic trimming and shoeing can be performed to provide support to the affected limb(s). 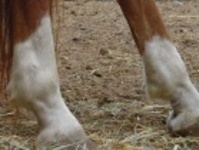 The toe should be trimmed short enough to allow an easy breakover for the horse, and the foot should be balanced from side to side and front to back. Wedging the heel up and applying bar shoes will provide support to the limb and relieve some of the tension on the suspensory ligament. A high wedge should be applied initially in severe, acute cases, and gradually brought down over time so that normal wedge pads can be used. Immediate relief will often be seen in with this application in painful horses. MSM (methyl sulfonyl methane) supplementation can be helpful to horses with DSLD, as it is reported to help restore flexibility to tissues. Pain management is also needed with horses that are lame. Phenylbutazone (bute) can be used as needed during the treatment process, because as changes are made to the horses shoeing, they can become painful for short periods of time. Previcox (firocoxib) is a selective nonsteroidal anti-inflammatory drug similar to bute, but it can be used for longer period of time without the risk of gastrointestinal side effects that occur with chronic use of bute. Stall rest is not beneficial for horses with DSLD as it is with traumatic suspensory injuries, due to the inability of the suspensory ligament to heal properly. As shoeing changes are made, decreased turnout is recommended. As the horse becomes accustomed to the changes, turnout can be increased. Riding is not advised for horses with DSLD, due to lameness, instability, and risk of further suspensory breakdown. Degenerative suspensory desmitis occurs in varying degrees and can be managed with shoeing changes, exercise restrictions, and supportive care. Just because your horse is diagnosed with DSLD does not mean that there is no hope for a long and happy life. Talk to your veterinarian about how to tailor an appropriate management plan for your horse. If you have any questions or concerns about your horse in regards to DSLD, please contact Conley and Koontz Equine Hospital at 877-499-9909 or info@ckequinehospital.com.